According to many, being the lead whiskey maker for Jack Daniel’s is the best job in the world. But what does being a master distiller mean? Lucas Hendrickson: Ask any 10 enthusiasts the best way to enjoy whiskey, and you'll probably get 15 different responses: straight, mixed, rocks, splash of water, splash of soda. The universe of options can be overwhelming. That's why we went to the source. On this episode, we talk to the guy in charge of making sure every sip of Jack Daniel's remains timeless: Master Distiller, Jeff Arnett, and the challenges of bringing new brands to an active whiskey marketplace, not to mention the advantage of making Jack Daniel's in one place for more than 150 years. My name is Lucas Hendrickson, and this is Around the Barrel. Welcome back to Around the Barrel, the official podcast from the makers of Jack Daniel's. Jeff Arnett lives in two states of being, simultaneously. Constantly in motion, yet very much rooted in one place. As the Master Distiller for the Jack Daniel Distillery, he's forever traveling. Throughout the United States and more than three dozen countries around the world. He's talking about Old Number 7 Tennessee Whiskey and the universe of brands surrounding it, but he spends the majority of his time in the hollows of Lynchburg, Tennessee. Jack Daniel's legendary home, making sure the quality of that famous export remains the same as it has for a century and a half. We caught up with Jeff mere hours before he'd get on yet another plane, and while he was autographing bottles of the iconic black label for friends of the distillery. The man is a rock star in the whiskey world, a rock star with perfect penmanship. Jeff Arnett: Hi, my name is Jeff Arnett and I'm the Master Distiller for the Jack Daniel Distillery in Lynchburg, Tennessee. I'm a native Tennessean. I grew up about two and a half hours away from Lynchburg and started out working in the food and beverage industry about 25 years ago. I worked for another company for about 10 years in three different locations, but I was always a huge fan of Jack Daniel's. I was a Tennessee Squire for those who know that program. So I had gotten calendars and letters for years from Jack Daniel's and was very excited when I sent away a resume to a job description that I thought I fit, to find out that it was the quality control manager's job for the distillery. So I started here back in 2001, and so for seven years I served in that capacity under the previous Master Distiller and again to learn the ropes and learn whiskey making from the best place on the planet to learn whiskey making, and that is from the people of Lynchburg, people who've learned how to make whiskey from their parents and grandparents and continue to carry that tradition on today. So the same people that taught me how to make whiskey are fortunately still here with me helping me do it and I get a lot of credit for all their hard work. So I really appreciate them. But yeah, it's a great job. I spend 80% of my time today here in Lynchburg and oversee all the whiskey making for Jack Daniel's, but also as part of my role will travel about 50 to 60 days a year and I've been in 36 countries in the last nine years. We're sold in over one hundred sixty so I guess if I'm in the job long enough, maybe I will maybe at least hit 70 or 80. Lucas: You got a lot of stamps to collect on that Passport. Jeff: Absolutely, and you know every drop is made here and we find that that's the best thing for quality control because we can ensure that every bottle will be consistent and the same and unfortunately, even though we're a dry town and a very small town with only one red light, we're able to make the product here and get it into all the different countries around the world. Lucas: Jeff Arnett, thanks for joining us Around the Barrel today. Jeff: Hey, it's a pleasure. Lucas: We watched you as you were getting prepped for this interview having to sign a few bottles for some friends of the distillery. Did you ever think when you came into this job that you would become such an expert on Sharpies? Jeff: You know, actually what one of the things that I inherited from my predecessor was a box of pens, and I found out by trying to use them. They were all the pens that he had tried and figured out didn't work. So literally everything that he had given me in that box was just completely worthless and I had to figure that one out for myself. So yeah, he gave me all his castoffs, but anyway I was able to eventually find a pen that worked for me and and I think my sixth grade teacher was the one that would not accept any work from us unless it was in perfect cursive handwriting. So I think she'd be proud to know that it has come in handy I would imagine over time because I've had I've had people tell me that I have excellent penmanship on the bottles. So, Miss Barnett. I appreciate it. Lucas: There you go. You know, we're just kind of getting rolling with this podcast and we're going to look at a lot of different aspects of not only the brand and the individual products themselves and the people who kind of intersect with this, but the question that always comes to our heads as well as probably you get asked this every single day. "What makes Jack, Jack?" Not only the whiskey itself but also as a brand, as a mythos, a legend that surrounded all that kind of thing, let's talk a little bit about what makes this Tennessee Whiskey so unique? Jeff: Okay. yeah, you know, a lot of times people say, you know, "What is that one thing that makes Jack Daniel's what it is?" and that is the hardest question to ask because I think truly a whiskey is the sum of its parts, and every part will matter, you know, the word whiskey is a global term, it can be made on any continent. It just means that you take grain. You ferment it. You distill it. You mature it in a barrel. So if that is your basic process statement, then you are a whiskey of some sort. Now of all the things in the whiskey world today, we are a Tennessee whiskey and our first cousin I would call it, in the whiskey world, is bourbon. You know to be a bourbon, you can't just be made anywhere, you have to be made in America. You can't just use any grain. You have to be at least 51% corn. You're not allowed to simply distill it, you have to distill it below 160 proof. And I think the biggest thing that separates bourbon whiskey from the other whiskeys of the world is that it's in the barrel, and that is that you can't reuse barrels. You have to use new charred oak for your barrel, and there's other provisions that basically say you can't use artificial colorings or flavorings. If you're in a new barrel at least two years you can call yourself a "straight," and if you're in at anything less than four years you have to use an age statement on your label. So I believe it provides some truth. I say that, you know American whiskeys I give them credit for saying that at least, it's an honest form of whiskey because of all the things that are required of it. And I think Scotch has done a really good job of creating rules that say if you know, if you call yourself a single malt or if you're a blended Scotch or whatever, these are the rules you have to follow. So they've made it where you could trust their label. I call it truth in labeling. But anyway, Jack Daniel's is a Tennessee whiskey and a lot of people say that Jack Daniel's can't be called a bourbon by virtue of charcoal mellowing, but that's actually not true. We do everything that bourbon does, we just do one additional step and this is a regional variant where right after we distill Jack Daniel's, if we just put our distillate right off of the steel into a barrel we would have to call ourselves bourbon. But because we go through ten feet of hard sugar maple charcoal filtration after distillation before the barrel, we call ourselves a Tennessee whiskey and this was, you know, historically what defined and what made Tennessee whiskeys different than bourbons, and this dates back to the earliest, we have newspaper articles that talk about the Lincoln County process and how Tennessee whiskey was distinctly different, and I would tell you for sure if there's one thing that kind of drives Jack Daniel's unique character, charcoal mellowing is a huge part of what you know Jack Daniel's to be. And you know, there's these billboards that you'll pass today that say, "It's not Scotch. It's not Bourbon. It's Jack." And I think that's absolutely true. I don't think we have the character of bourbon, I certainly don't think we have the character of Scotch. So we're kind of in a space by ourselves and it's an interesting space to explore. You know, we were one of three distilleries in the state just a few years ago, and now we're over 30 distilleries in the state and each of them kind of has their plans for how they will use the charcoal mellowing process. I think it's going to create an interesting place where people can show off their innovations, their craft and creativity. 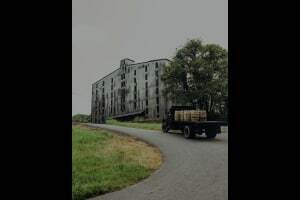 So I'm interested to see and taste what others will try to do with it, but for us definitely charcoal mellowing has been long our signature at Jack Daniel's and what makes Tennessee whiskey different than bourbon. Lucas: So that's the whiskey itself obviously, but there has become this global kind of mythology in a lot of ways, not only in pop culture from Frank Sinatra to rock and roll to R&B from a music standpoint, but also in the movies and television it has this distinct mythos about it that very few other brands of any kind have. What do you think it is about? Not only the whiskey, but also where it comes from, that kind of adds to that? Jeff: Well you know, I think whiskey, unlike other distilled spirits, is a product of its place and it takes on a lot of regional variants, I call it. You know, I compare it to vodka. Vodka is not supposed to taste like anything, you know, if it's done correctly, if it's really pure it won't have any character, Therefore, it really doesn't matter where it's made, as long as it's made correctly, to have the right character. So you can make vodka I think anywhere, you know, people will talk about the quality of the water, and certainly that would matter, but whiskey is definitely different. Because your yeast culture, a lot of those if you have a proprietary yeast cultures as we do, it was harvested from the local area and it's going to have a flavor or a character that is unique to its place. You just have to use grain to be a whiskey, but you can use wheat, you can use rye, you can use corn and malted barley, all these different things and the mix that you choose of those grains, because most people don't just use one unless you're Scotch. But the way you mix the grains, the yeast culture that you use, whiskey has become much more regional and have much more variation for that reason. So I think whiskey is a very diverse category, therefore a very interesting one, for that reason. So I always say that I truly believe if people are open to trying whiskey, just because the first one that you try you don't like, don't give up. They are so different. You see such a variety of different character, flavor, mouthfeel, level of sweetness or oak, you know, I think ultimately I always say how people choose wines, you know, if they have a favorite wine, a lot of it comes down to the level of oak that they tend to like, which is an aftertaste. That's why you see with Jack Daniel's, we've come out with different variants of our own product, using charcoal mellowing as a way to kind of lever, where we can we can go to the top floors of a warehouse and add oak, add finish, or we can basically go back to charcoal mellowing again after maturation and greatly soften that, in the case of Gentleman Jack. And you're not wrong for thinking that Single Barrel Jack Daniel's is better than Gentleman Jack, nor are you wrong for thinking that Gentleman Jack is better than Single Barrel, it all comes down to preference. Lucas: Well, that's been the interesting thing especially over the last 10 years or so as the product line has expanded like it has, with Tennessee Fire, Tennessee Honey, the country cocktails are kind of folded in with that brand name as well. So, there's something for everybody involved in this brand now. Jeff: That is certainly what we hope. You know, when I became Master Distiller that was back in 2008. We had three main products, which would have been our signature Old Number 7 Black Label Tennessee whiskey that has carried us since prohibition, and really all we focused on for many years. And it wasn't until the 1980's that we began to look at it and say "Hey, not everybody describes their perfect whiskey the same way" or what they would prefer it to be, so we began to try to answer that. You know, Gentleman Jack became our first way of answering people who like the softer finish, and mellowing was the answer to that, so we came out with that 1988, but a lot of people will try our Old Number 7 and say "Yeah, I really like that but I'd like that on steroids. I want more character, I'd like to explore different barrels with you." I know not everyone is different so we came out with Single Barrel for the first time in 1997 to answer these people who consider themselves to be very discerning whiskey drinkers, who wanted to explore our brand with us and that was one of the first products, I was the quality control manager here when I joined in 2001 and I was only in a few months, when I was given Single Barrel as I was the Processing Manager there which put me on the Master Taster's panel, and so it quickly became my favorite version of Jack Daniel's because I imagine that was my baby. Lucas: The Master Taster's panel being something that everybody thinks they want to be on and doesn't realize the kind of the process that has to go into that. You've got to be committed to that role. Jeff: Well, you know my very first Master Taster's panel for Single Barrel, I never will forget it. I had less than a year's experience with Jack Daniel's. I had worked in the coffee business so I had learned the sensory sciences there. So I felt like I certainly understood the palette and I could taste things and taste differences, but how you communicate what you're tasting and what your experiences are, you have to learn the language. I noticed that I wanted to comment on the same samples that the others in the room did but I was kind of humbled to be in the room too, because they were like six or seven people in there that day and they had between, I started adding it up, they had 200 or 250 years of experience among them. So I was like, "What am I doing in here?" These are like the wise Sages, you know, these are the "owls" of the brand. Lucas: But was it a good thing overall for you to add some fresh "taste buds," for lack of a better term, to that panel? Jeff: Well, you know, of course the panel today looks very different than when I joined 16 or 17 years ago, but I think it's important that you do need to bring in fresh blood because your palate changes over time. Well, mine has changed and what I like in a whiskey has changed as I've gotten older and that's part of expanding the portfolio as we have, is that we realize that whiskey for most people is going to be a journey, and what you start off on is not going to necessarily be what you end on, and you're going to want to explore. Just natural curiosity says, "Hey, I like this but I don't know if I would like that or not, maybe I should try it." Which kind of led us down the path of saying hey, we know that rye is becoming a growing category, it's the fastest growing form of American whiskey today. How unfortunate would it be if we have loyal Jack Daniel's drinkers who who are curious about rye and start to try rye whiskeys and find out they really like the character of rye, but they don't have a Jack Daniel's offering in that space. So that was why it was important for us to say, hey, if you want to be brand loyal and stay with Jack and if you've already tattooed yourself with Jack Daniel's, but you found out now that you're a rye fan, now you don't have to go scrub your tattoo off. You can go ahead and keep the tattoo. And it's a quality offering from Jack Daniel's too, I was really proud of how that one turned out, and that was our first new grain bill since prohibition. It was an important step for us to take, and we're not done, we're going to continue to explore other grain bills. Lucas: Because that's a relatively new product, I mean it was just this past year, correct? Jeff: Well, new to the public but we started it back in 2010, distilling it, and we loved the character of it right off the still, and we know enough about our barrel, we make barrels for ourselves so we can be greatly confident of the color, the character, you know, the level of sweetness and oak that the barrel is going to bring to the distillate and just tasting it up front we were already very confident that what the barrel was going to add to its inherent character was really going to be nice and balance it out. So we weren't disappointed, as we watched it develop in the barrel, as we were tasting along the way, we were kind of like "Okay, this is really going to be good." Yeah, so we didn't make much in the early years so we chose to offer it as a Single Barrel, kept it special, kind of did what I would call more of a soft launch on that. But now we've got our core out for people who are wanting an everyday drinking rye, I think we've got a really solid offering there. Lucas: So I realized that there's probably no such thing as a typical day for you, especially when you're out on the road and traveling as much as you do but as best you can, detail what exactly does a Master Distiller for Jack Daniel's do in the 21st century as far as literally, you know touching the product, so to speak, and getting it ready to head out into the marketplace? Jeff: Well, one of the good things is even though Jack Daniel's is in a lot of different countries today, we make every drop in one spot. So that means I don't necessarily have to run around from one manufacturing, you know one distillery to another, every drop is here which allows me to spend 80% of my days are going to be driving into the hollow in the morning, overseeing the whiskey that we produce here, and I've got a very talented group of people who help me do that. There's about about two dozen people who work in our control room who are the main people behind taking water and grain and yeast and fermenting and distilling it, and I would put them up against anybody in the industry. They love the brand. They wear Jack Daniel's shirts when they're here, they go home and put on their clean Jack Daniel's shirts to live out their life. They're very proud to say that they're a whiskey maker here, as am I. So 80% of my time is going to be here in Lynchburg overseeing the whiskey that we make, making sure that we're tasting it. You don't want to wait years down the road before you start tasting the product to figure out if it is what you want it to be or not. So it's important that as soon as you reach certain points in the process where you can measure or taste or confirm character, you want to do that because putting a bad whiskey into what we know will be a good barrel because we make it for ourselves, could still come up short. Lucas: But again, that core group of people who have been involved in this for decades to have that institutional knowledge is just invaluable. Jeff: Oh, it is and you know, we're very fortunate, and even as Master Distiller people have said, you know, "What have you done to put your signature on this brand?" and I'm like well, of course, I would say at this point because it's not so much me, it's the nature of the whiskey business today, I'll be known for a time that we've come out with a lot of new products. And that wasn't solely my decision but it was like this is what we need to do as a company just to stay healthy and to stay relevant and things like that, but I would say that every Master Distiller's responsibility is to not change it. Lucas: Right, make sure you don't necessarily put a stamp on it. Jeff: Yeah, you know of course clearly I had some latitude with what the rye would taste like and how it would be, but what's more important is that nothing I do changes the character of Black Label. If you're a fan of Black Label, if you love it today, you're going to love it tomorrow. I can promise you that because I'm not I have not intended to change any of that. Gentleman Jack, Single Barrel, these are products I inherited and I think every Master Distiller has understood that this brand still belongs to our Founder. You know every day you make it, make it the best you can. That's my responsibility is to make sure we don't compromise. We don't do things to knowingly lower the quality of the product. We want to make something that is reliable, that is familiar, that is consistent. You know, I think that's the strength of Jack Daniel's is that you can find it at any bar no matter where you are, and you know where it's made, you know who's made it. There's a lot of whiskey brands today that you don't have any idea where their distillery is, or where their liquids came from. And because whiskeys are regional, and I think because quality is kind of hair trigger, you know, you can't necessarily say that all whiskeys are going to be great. It does matter where they're made and who has made them. We make every drop for ourselves and I think that's part of you know, I don't want to lose Jack Daniel's equity by putting out inferior products. You know, I'm always say I'm always willing to put out a new product if I feel like it's worthy of the Jack Daniel name, right? So: What would Jack do? You know? WWJD right? What would Jack do? He insisted on putting out a great product and I have 500 people here watching me. They're counting on me and I'm counting on them, you know, it's a mutual thing here. But together I'm convinced that we will make good decisions. Lucas: You talked about remembering very vividly your first tasting panel. Do you remember the first time you had Jack just as a regular consumer? Just kind of getting to know your your whiskey journey? Jeff: Yeah, you know, I think what I remember first drinking was beer. I think a lot of people start off there. It was in college that I drank Jack Daniel's for the first time. I had a roommate and he was more of a brown spirits person than I was. So it was kind of his interest in it that we would be sitting around, you know, trying to study but say, hey, let's go grab something to drink but he would order whiskey so I remembered the first thing that ever had from Jack Daniel's was a Jack and Coke, and people ask me that all the time you know, do you think it's heresy because I put something into the whiskey. I'm like no, I think that's important. You know, it's a gateway. Yeah, you know a lot of people, if we're waiting for people to drink whiskey neat or straight, you know that you'll be waiting a long time, and I think people people if they'll start off with a Jack and Coke or a Jack and Ginger or a classic whiskey cocktail, you know, a Manhattan an old-fashioned or sour, I think Jack Daniel's works well on all of those. We have different variants that I think are actually better than others, you know, as far as how those could be constructed that I try to give to bartenders as guidance, but you know I think that's an important part because when I first started off drinking, it was a little bit of Jack and a lot of Coke and then if I have one today, it's really a lot more Jack and just a touch of Coke, you know, so that's part of your maturation, your journey, as far as how much you like the product but you know our best product I believe today is literally our barrel-proof Single Barrel. Lucas: I can't fight you on that. I'm not going to. Because even the very slight but noticeable flavor differences within each of those Single Barrels that I've tasted over the years. I mean, they're each memorable in their own way and yet you absolutely know that it's Jack Daniel's. Jeff: Well, you know, that has always been I think one of the interesting things about a Single Barrel is that you'll have that variation of character, but we've always locked it in and gotten it to a set bottle proof, and it's different for different markets. It's 90, 94, 100 based on the style that we're doing. But to let it vary, you know from 126, 127, all the way up to I've seen as high as 138, come from us. So you add one more dimension of character and variation there and I would tell you that the 138's are as smooth and as drinkable as the 127's or the 94's to me, surprisingly. Of course my guidance is always that, never look at the label and assume that you know what you want to do with it, or what you're going to have to do with it. My own guidance with any bottle of whiskey is always take the first sip neat, then make an educated decision about whether or not, if you want to add ice or you want to add water, that's all fine. You know, work your preference, but don't start there, just take work up to it. Take that one sip, evaluate it for yourself and make an educated move. Lucas: So we've talked a little bit about the differences between Tennessee whiskey and bourbon and scotch and the the characteristics that go into the creation of all of those things. Talk a little bit more about that charcoal mellowing process that that does set Jack Daniel's apart from everything else in the marketplace. Jeff: Sure. The Lincoln County process, what it does to make Tennessee whiskey different than bourbon, the way charcoal works is it's like a sponge, you know and a lot of people will use slang terminology that we say that it sweetens the whiskey as it passes through it. A lot of people think that the wood is somehow imparting a sweetness to it, that it's because it's a hard sugar maple wood that we use, that somehow the would kind of imparts that to it, but actually it reveals that in the distillate because of what it absorbs. So charcoal is much more like a sponge and should be viewed that way, that as whiskey flows through it, it tends to pull things into itself, and it alters flavor by what it removes. It's sort of like putting a carbon filter on your tap water at home, you know the water if it doesn't taste good coming directly out of the tap you put that on there and it tastes better not by what it's added, but what is removed, so and charcoal is the same way. That's why the charcoal doesn't last forever. It's like a sponge and once a sponge is saturated, once it's full, it's got to be changed out. 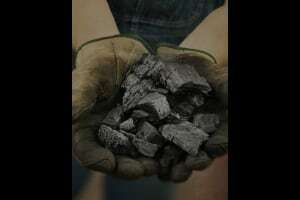 So, it's not just important that you go through charcoal. You need to be tasting it, you need to be analyzing it, you need to make sure that it hasn't become saturated because if it is, it's not really doing any good. So that's why we're tasting every vat each week. We're changing it out on some frequency to ensure that the magic is happening in each of the vats, but it's removing things that tend to be bitter in flavor and it's not very intuitive to think, but you know corn is a sweet grain, but in a sour mashing environment, when you ferment it and distill it, it brings a lot of bitterness over and it tends to mask its own sweetness with a lot of bitter elements. So if you look at historical documents about bourbon whiskey, the thought of the barrel, or the rationale for why it needed to go in the barrel was that the barrel would soften its bitter edge or some terminology of "the softening" of this bitter character, and when you taste our distillate right off the still it has an aftertaste of cooked corn that falls in the back of the throat, that's the bitter zone. So, we have that characteristic of bourbon for sure. That's why Jack Daniel's isn't disqualified from being a bourbon, but I reason because we've done everything in the process, our grain bill, our distillation proof, where we make it, all those things satisfy and check off all the boxes of bourbon, but the character going in and coming out is so different that Tennessee whiskey was seen to be a different product. It was by Jack Daniel, it was by a lot of people who use this Lincoln County process, you know, I think it's kind of interesting that I'll hear from time to time that Jack Daniel's can't call itself bourbon by virtue of charcoal mellowing. Actually, we have a letter that we have in archives here at Jack Daniel's and it's dated December of 1941 and this would have been after Tennessee's prohibition period had ended. So Jack Daniels' was coming back into the marketplace here locally, and there was a petition, there was a guidance that came out of the Alcohol Bureau in Washington D.C. that said "We've looked at your process and there's no exceptions in the process to calling yourself bourbon, therefore we would like you to call yourself bourbon." So Jack was gone at this point, you know, he had died about 30 years before, so his nephews the Motlow's had the distillery. That's who he willed it to. They contested it and said "Our uncle said that Tennessee Whiskey was different. It was by virtue of charcoal mellowing that we were no longer a Bourbon." So they decided to resolve this difference of opinion by traveling to Washington D.C., They took before charcoal mellowing and after charcoal mellowing samples from the distillery. They also held reference samples of the other distilleries that were making bourbon, and they did a tasting in Washington and they wrote us a letter back and they said "You know what, we have tasted your product and we agree that your product doesn't necessarily have the character that is typical of bourbon whiskey, therefore we won't contest your label again." So we've held on to that, and my standard joke, this was dated 1941 so it was about 75 years ago, and I always say that we held onto a copy of that letter because it's the only evidence we've got that the federal government made a good decision in all that time. But we hold out hope, we hold out hope that they'll have another good one. But nevertheless..
Lucas: Do you keep a copy of that on your phone these days just to make sure? Jeff: No I don't, no, just fun in there, but nevertheless, you know, they decided just like we had decided, that Tennessee Whiskey, that the charcoal mellowing process truly created a different spirit. So that's kind of how it came into being. Lucas: Well Jeff, thank you for your time and we look forward to you being with us several times as take this journey Around the Barrel. Jeff: That sounds good, you know, you'll never find me short of words when we're talking about whiskey or Jack Daniel's. 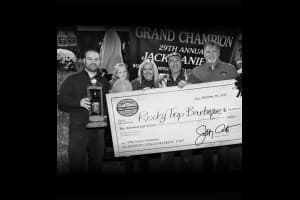 It's become my life's passion and I'm proud to work for brand that I believe in as much as Jack Daniel's. It's a great job, a perfect blend of art and science, which you know meets my needs on so many fronts. Lucas: I would imagine, I'd imagine. Thanks again for your time. We will talk to you very very soon. 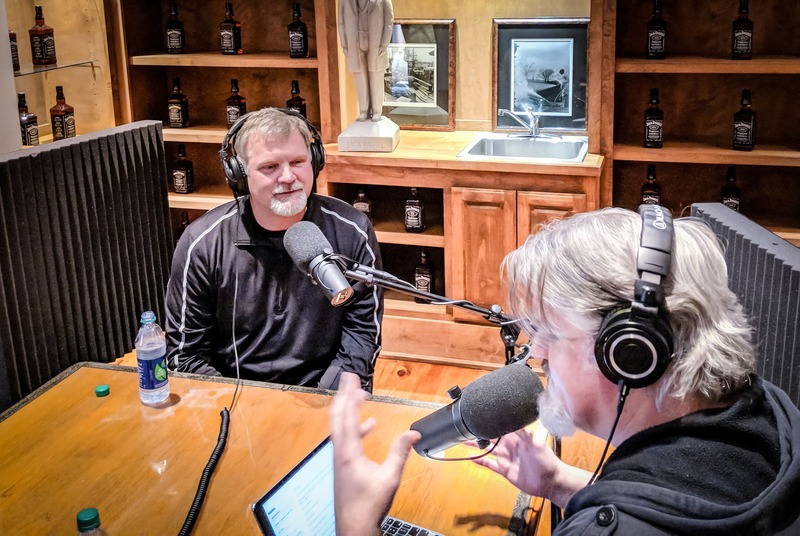 Lucas: Around the Barrel is the official podcast of the Jack Daniel Distillery. Follow the podcast on the web at JackDaniels.com/Podcast. If you like what you hear, please subscribe, rate, and review on Apple Podcasts or wherever you gather your on-demand audio, and always remember, with great podcast and great whiskey, please enjoy responsibly. Join us next time for more conversations Around the Barrel. Your friends at Jack Daniel's remind you to drink responsibly. Jack Daniel's and Old Number 7 are registered trademarks, copyright 2018, Jack Daniel's Tennessee Whiskey, 40% alcohol by volume, 80 proof, distilled and bottled by Jack Daniel Distillery Lynchburg, Tennessee. Around the Barrel is intended for listeners 21 years of age and older. Host Lucas Hendrickson sits down with Jack Daniel’s Master Distiller Jeff Arnett on this episode of Around the Barrel with a conversation that covers everything from his job duties and penmanship to the wide world of whiskey and what makes Jack so unique. With more than 150 years of history, there’s never a shortage of people to talk to and stories to tell. Follow our journey Around the Barrel by subscribing to the podcast on your favorite on-demand audio platform or listening on the web.